Current protein rationing schemes use a factorial approach, whether they aim to define amino acid requirements for a given level of milk production (AFRC, 1992) or to predict the response of milk production to a change of nutrition (BBSRC, 1998). Hence they must incorporate an estimate of the efficiency with which amino acids are put into milk protein. The overall efficiency of use of amino acids for synthesis of milk protein may be pictured as consisting of two components: the partition of amino acids between the udder and other body tissues, and their efficiency of use within the udder itself. As for their use within the udder, it is of interest that rates of total protein synthesis in the gland have been estimated at 1.3-2.5 times greater than the rate of milk protein secretion (see Bequette and Backwell, 1997). However, what this means for the overall efficiency of incorporation of amino acids into milk protein within the gland is not clear. Although a high turnover of protein would be expected to increase the energy cost of secretion of milk protein, it need not have any significant effect on the incorporation of amino acids into milk protein. For present rationing schemes, the most appropriate measure of efficiency would be a coefficient of apparent transfer of amino acids into milk from small intestinal contents, or from blood. But reliable estimates are scarce and the adoption of a fixed value, based on inadequate data, is a recognized weakness of all but one of the current schemes. Even where it is recognized that the efficiency of use will vary among the EAAs (O'Connor et al., 1993), the estimates available are few and probably unreliable. Of course, the efficiency will vary with nutritional circumstances, depending on which amino acid is first-limiting and on the competing demands on amino acid use for purposes other than the synthesis of milk protein (Oldham, 1994). 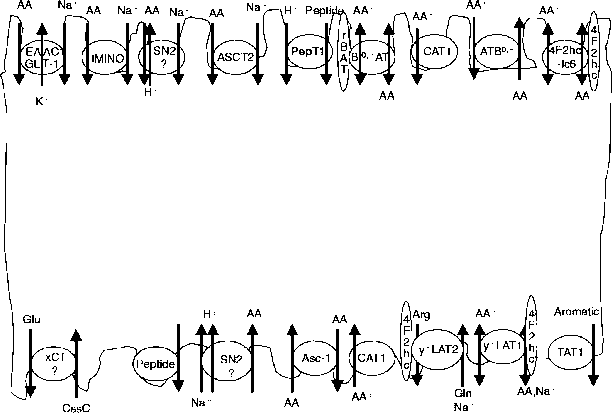 However, a useful starting point would be to define the maximum efficiency of transfer for individual amino acids. We can get this value from the efficiency of transfer of each of the EAAs into milk when it is first-limiting. This can only be measured reliably from a dose-response line, the efficiency being the slope of the linear response. Such measurements are scarce because it is difficult to achieve a linear response with practical diets, for which the small margin between first-, second-, and even third-limiting amino acids (Schwab etal, 1976) allows only a small response to the first-limiting amino acid. In the absence of tracer techniques, dose-response relationships can be obtained only if the potential response of milk protein yield to addition of the first-limiting amino acid is sizeable. Kim et al (2001b) formulated a histidine-deficient diet based on grass silage and a cereal-based supplement containing feather meal. They then measured the response of milk production to three levels of addition of L-histidine given intravenously, in a total of three experiments (Kim et al, 200lb,c). 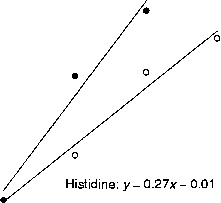 The response to histidine was linear, such that the increase in the output of histidine in milk protein (y, g day-1) was related to histidine infused (x, g day-1) by y = 0.4lx + 0.05 (n = 8; r2 = 0.940; Fig. 20.4). 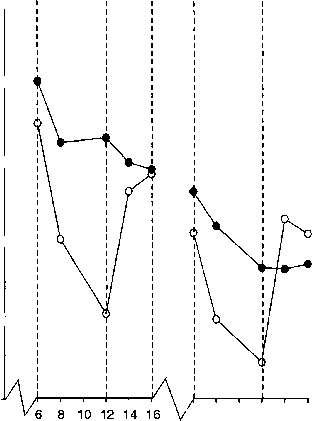 This indicates an efficiency of transfer of L-histidine from blood to milk of 0.41, which is well below the value of 0.68 adopted provisionally in AFRC (1992). Furthermore, results of experiments in which lysine (Schwab et al, 1992) and histidine (Korhonen et ah, 2000) were infused abomasally in increasing amounts when they were first-limiting offer support for a low efficiency of transfer of histidine (Fig. 20.5). These results show a lower efficiency of transfer (0.27) for histidine than for lysine (0.45), which convert to 0.53 and 0.32, respectively, for the efficiency of transfer from blood to milk, assuming an absorption coefficient of 0.85 (AFRC, 1992). In keeping with these reports, results of tracer studies in la eta ting goats also suggest that the efficiency of use of histidine for milk protein synthesis is likely to be low. The partition of the plasma flux of histidine to the mammary gland was <0.2 compared with values of 0.3-0.4 for most of the other EAAs (Bequette et al, 1997). be consistent with the increment of protein having to provide glucose for lactose synthesis, by gluconeogenesis from amino acids, as well as amino acids for synthesis of milk protein. Presumably, a similar argument would apply to responses to amino acids infused into the postruminal gut or into the blood. The efficiency of transfer of the amino acid to milk protein would then depend on the glucose status of the cow. To what extent this might explain low efficiencies for lysine (Schwab et al, 1992) and methionine (Pisulewski et al, 1996) is not known. However, we can rule it out for histidine because Kim et al. (2001c) Infused cows intravenously with L-histidine, with or without glucose, and found that the efficiency of transfer was 0.42 for both treatments. Moreover, although Korhonen et a I (2000) included 350 g day-1 of glucose in all their histidine infusion treatments, the efficiency of transfer of histidine remained low. The status of the animal's body reserves of protein also needs to be taken into account. After a period of underfeeding, protein infused postruminally was partitioned between milk protein synthesis and the synthesis of tissue protein, with the overall efficiency of use for the combined processes remaining roughly constant, as judged from nitrogen balance measurements (Whitelaw et ai, 1986). However, when cows were in positive nitrogen balance, postruminal infusion of proteins increased secretion of milk protein but did not affect nitrogen retention (Choung and Chamberlain, 1992b). It would follow that, in experiments in which cows were given basal diets deficient in amino acids and which induced mobilization of body reserves, supplementary amino acids, given during the experimental periods, might be used to replenish body protein and, in the case of histidine, body stores of carnosine and possibly haemoglobin. At this point, it is worth remembering that the more sophisticated experimental techniques based on infusion of amino acids postruminally, especially infusion of amino acids intravascularly, are, of necessity, short term. If the interpretation of protein-feeding experiments can be complicated by the need to consider the cow's labile reserves of protein (see Botts etal, 1979), then that is especially true for short-term infusion experiments. Protein depletion-repletion experiments show labile protein reserves of around 20 kg in cows of 600 kg (Paquay et ai, 1972; Botts et al., 1979). It is estimated that, in severe undernutrition, cows could mobilize up to 300 g of protein a day to support milk production and this might be maintained for 6 weeks or more, depending on the condition of the cow (Botts et al., 1979). It is easy to see how the mobilization of body protein might mask the effects of dietary deficiencies of amino acids in the short term. and 4 weeks after changing to the amino acid-deficient diet fig. 20.6), it is reasonable to infer that the cows mobilized reserves of amino acids to lessen the effect of the deficiency on milk production. This in turn means that when the animals were returned to the fishmeal control, their protein reserves were in a depleted state. It might be expected, therefore, that the extra amino acids provided by the fishmeal would be partitioned between milk secretion and tissue synthesis (Whitelaw et al., 1986). No measurements of nitrogen balance were made but it is worth noting that haemoglobin concentrations increased on the return to the fishmeal diet by, on average, 14 g 11 of blood over the 4-week period. This would amount to about 1.3 g day"1 of histidine going into haemoglobin, assuming a blood volume of 38.5 litres (Frandson, 1981). Reducing the histidine available for milk protein synthesis by 1.3 g day"1 would increase the calculated transfer efficiency into milk to around 0.54. In histidine deficiency, haemoglobin levels are reduced after prolonged periods of deficiency and carnosine stores in muscle are reduced almost to zero (Cianciaruso et al., 1981). Since the decrease in haemoglobin occurs only after depletion of carnosine is well under way (Cianciaruso et al., 1981), it is reasonable to assume that a fall in haemoglobin signals that substantial depletion of carnosine stores has already occurred. Again, since methionine is close behind histidine as the second-limiting amino acid, body protein would also need to be mobilized to supply methionine to maintain milk production. It would seem likely then that the low transfer efficiency for histidine into milk was caused by its use in replenishing carnosine stores and possibly also in restoring levels of haemoglobin and body protein. The overall implication of the experiments with histidine-deficient diets is that estimates of the efficiency of transfer of amino acids into milk will very likely depend on the status of the cow's body reserves. This information is not normally available and is difficult to deduce, especially in short-term infusion experiments. The findings further imply that assigning values for the efficiency of transfer in protein rationing schemes is likely to be more difficult than expected. In addition to stage of lactation and nutrient status, in particular the supply of glucose precursors (see Oldham, 1994), we may also need to consider the cow's nutritional history.